I Love You More Than Carrots: Everything Is Better Dipped In Dark Chocolate. It's no secret that the Husband and I don't get out much anymore. With an eight week old, it's difficult for me to steal away for more than two hours at a time what with our current on demand feeding schedule. I'm not complaining because I know this is just a season and pretty soon Maclane will be a year old and I'll be wishing to have those early days back again, however, it would be nice to be able to get away for a night to reconnect with my man. Until then, we've become really great at throwing little at-home Date Nights. Most recently, and many thanks to current ILYMTC sponsor and Velata Consultant, Kim, we opened a bottle of chardonnay and broke out our fancy-pants Velata Fondue warmer for the very first (and certainly not the last) time. Kim graciously sent me the Noir Velata Fondue Warmer along with the Premium Dark Chocolate melt mix (did I mention that it's Gluten Free?) and from the minute that sucker arrived on my doorstep, I couldn't wait to try it out. It goes without saying that I had to test each of the desserts as I was setting up for our at-home Date Night. You know, standard quality control. What did we fondue, you ask? 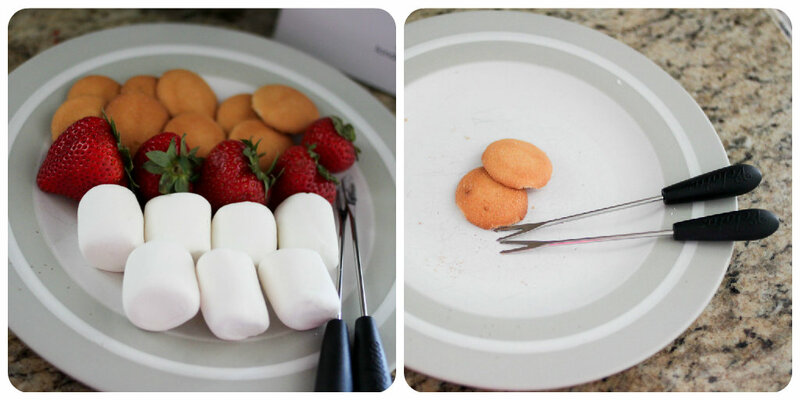 Nilla wafers, fresh strawberries and marshmallows, of course! Let's just say, it's a good thing I had The Husband home to share this scrumptious dessert with. Had he not been here, I would have easily downed our entire date plate all by my lonesome and believe me, I wouldn't have regretted a single wafer, marshmallow or strawberry. As for the dark chocolate? It was creamy, smooth and delicious. As a dark chocolate expert, it was on par with some of the most expensive chocolates I've tasted. Everything is better dipped in dark chocolate may as well be my new life motto. 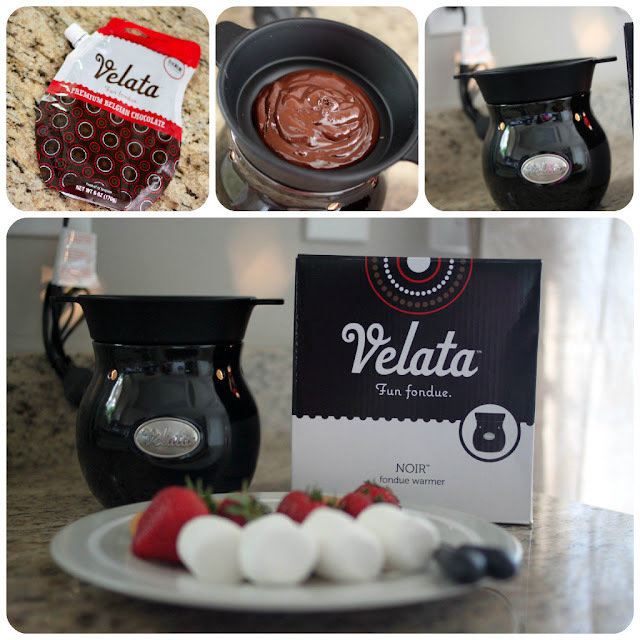 I absolutely loved everything about the Velata Fondue Warmer and Premium Dark Chocolate mix. It was so incredibly easy to set up and within less than five minutes, the chocolate was melted and ready to enjoy. I was a bit leery when it came time for clean-up- I imagined it would be a bit of a chore cleaning warmed and melt-y chocolate-y goodness from the warming plate but thanks to the brilliant minds behind the Velata Fondue warmer, the warming tray is made from easy-to-clean silicone and is both dishwasher and microwave safe! 1. Velata Fondue Warmers use a 25 watt bulb to keep the chocolate at a delicious and most importantly safe dipping temperature. 2. The bulb temperature can be dialed up or down with the dial on the cord to meet your desired temperature needs. 3. As I mentioned earlier, the warming plate is made from silicone which means it stays nice and relatively cool to the touch- I don't have to worry about tiny hands grabbing for it and risking a burn. As for The Husband? He gave our Date Night two (chocolate covered) thumbs up! Velata Fondue would be the perfect activity for a simple at-home date night or a post-dinner-party dessert with friends. Be sure to shop Kim's current party and pick up a Velata warmer and premium chocolate for yourself! You can also find Kim on Facebook where she frequently posts about delicious sales and parties! Disclaimer: I was not compensated monetarily for this post, however, Kim did send a warmer and premium dark chocolate melt mix for me to review. The above opinions are 100% unbiased and honest. Now I need pics of a chocolate faced Carter! I certainly agree that everything is better with chocolate! We love dipping things in chocolate. Add original pringles to your list of things to try....sooo yummy. And pineapple! chocolate covered strawberries are my favorite dessert. 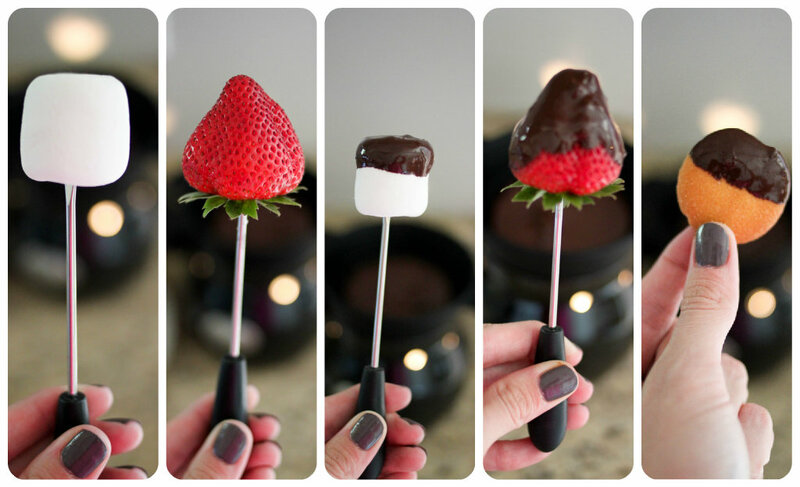 This is making me want to break out our fondue kit. Yum! inappropriate, but the first thing i thought of after i read the title was: that's what she said. Probably not a good idea I'm reading this at darn near midnight and now I want to midnight snack. YUM! Best take-home message from this post? Your nails look amazing. What color is that? I love it. How the heck do you have perfectly manicured nails with a toddler and a newborn? I have a very similar motto - dark chocolate makes everything better! :P Even on it's own!